Today we are pleased to introduce Amit Shimoni and his successful project: Hipstory. Now also available in our gallery. About myself, I am a young Israeli illustrator and designer, 28 years old from Jaffa, Israel. I graduated from Bezalel academy of arts and design in Jerusalem, in the department of visual communication which is considered to be one of the best in Israel. I think anything can be turned into an illustration, seriously anything, whether it is scenery or a feeling; and I believe an illustration has a place anywhere, seriously anywhere, whether it is in the Louvre, or on coasters, if it is illustrated I love it. What were the reactions of the people around the project? HIPSTORY started when I reflected on the Israeli culture and leaders in the past, and compared with today. I started with depicting and illustrating the Israeli generation of founding fathers of the country. and you can't believe what the reaction was, it was amazing. Young and old all were inspired, and also had their own perspective of the series. Everyone had something to connect with. 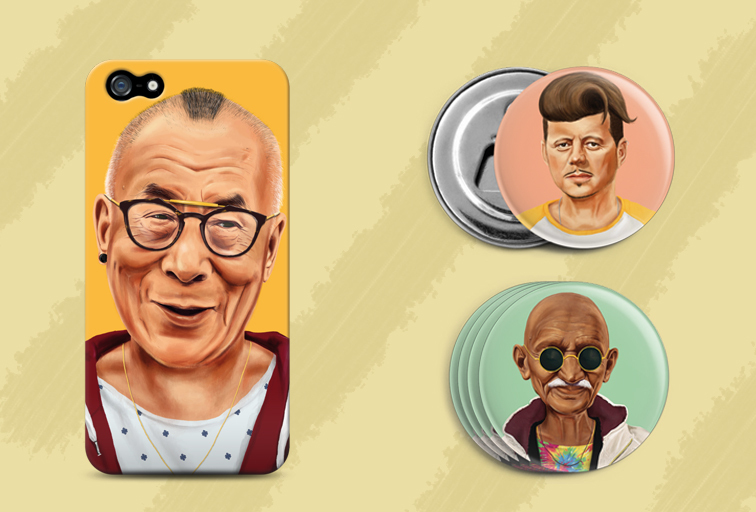 HIPSTORY wishes to reimagine the great leaders of modern history and to place them in a different time and culture - ours. In our time and culture, the 'big' ideologies are lost - we have grown tired, or perhaps too smart, to follow big systems of absolute ideas and beliefs. But have we lost something in this process? With nothing to hold on to, we are becoming global beings - focused more on our individual selves and less on society and ideology. HIPSTORY wishes not to criticize, but to shed new light on the way we think of ourselves and the figures who inspire us. I often find myself imagining a world where some of these leaders are less interested in influencing lives, and more focused on their own personal. Imagine Gandhi obsessing about his looks, and not about releasing India from the British rule? Or Abraham Lincoln searching for a hip bar, instead of abolishing slavery? Although all of these great leaders were a part of a collective identity, they were all still unique and innovative in their own way. Will there be any other "Hipstory characters" soon? I am planing to expand the series and have some more local figures for each country as France, Germany, Spain, and whereever! There are great leaders all over the world, I just need to hipsterize them.